Creative Machine Embroidery has brought machine embroidery out of the closet and how! 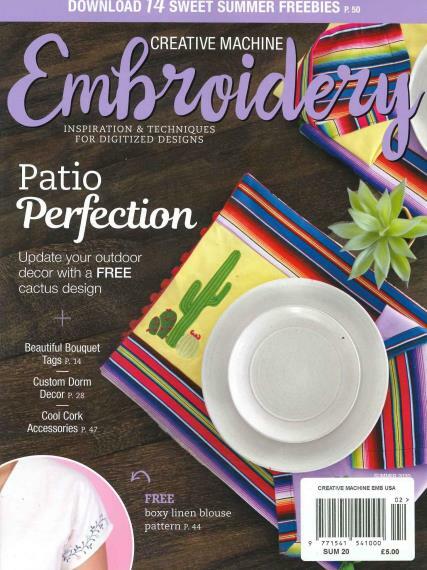 Buy a single copy or subscription to Creative Machine Embroidery magazine. It is really remarkable as to how as to how an actively such as machine embroidery has been jazzed up so much so that people are actually considering it to be a really interesting pursuit to follow. The magazine has actually had a significant role to play in this transformation. Machine embroidery is definitely not a skill that is mastered overnight. Creative Machine embroidery features tips and tricks for the experienced home machine embroidered and also for relative inexperienced machine embroiders who have just inculcated an appetite for machine embroidery. Creative Machine Embroidery, among other things, features a lot of articles regarding the current trends of the season, and some illustrated features which explain in great details, how to recreate complicated patterns through machine embroidery. One can constantly stay updated about the latest in the world of machine embroidery from experienced home embroiderers. Besides, if you have managed to create unique designs or patterns of your own through machine embroidery, Creative Machine Embroidery might feature you in their next issue! Haven't had a whole lot of time to look at it, but I do like that it gives sources for items needed for the projects.